These little quilts are for two special children. I started them last year as part of the Rainbow Scrap Challenge hosted by Angela at SoScrappy. The one above has been framed with trains...perfect for a little man. The bright boyish colors just pop outdoors. The second softer quilt, is for a little sister....framed with pale blue butterflies and yellow cornerstones. I love this one. A close up below with lots of texture from the quilting. Although I have several tops to finish, it has been easier this year.....even though I am doing Bonnie Hunter's mystery! Sarah at Confessions of a Fabric Addict is hosting to her weekly link and I have a double reason to join. And such a lovely double reason! Both are wonderful and I'm sure they will be well-loved!! Whoop whoop!! Great quilts! So bright and cheery. Love your quilting. amazing and gorgeous! love scrappy! Congrats on two finishes at once!! That's awesome. They are great quilts! Love the finished quilts. What is the name of the block you made?? Great rainbow block finishes. These quilts will be loved. I do love that great texture from the quilting. You have a couple of great finishes! Love these! So fun and colorful!!! They are very nice both of them. Congratulations ... or should I say Double Congrats!! Two beautiful quilts! 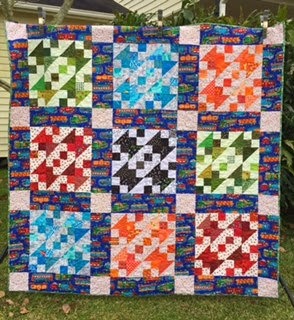 So unique with the different sashing colors, but with the blocks to tie them together. What wonderful gifts for two lucky children. You've created two unique looks but the block design links them together. Super work!